Herbacin USA: Is Eye Cream Really Necessary? With so many different types of skincare products on the market, it’s hard to know which ones are the most helpful. Unfortunately, many people skip using eye creams and instead use their regular face moisturizer around their eyes, hoping to save a few extra bucks. So, are eye creams just face creams in smaller bottles? The short answer is NO! The fragile skin around the eyes has different needs than the rest of your face, so you need a special product that addresses those needs. But before we get into the importance of eye creams, let’s do a quick refresher on how and why wrinkles occur. Free radicals (from UV rays, pollution, etc.) damage cellular DNA, so skin cells can’t reproduce as efficiently. Skin quality declines over time, resulting in fine lines and wrinkles. Collagen is the protein that gives young skin its supple texture with a remarkable ability to bounce back from all of our facial expressions. As we age, however, collagen production naturally drops off and our skin loses its elasticity. Skin doesn’t bounce back as easily, and fine lines develop. Excess sugar molecules damage the body’s proteins, causing a whole host of health problems. Glycation also affects skin proteins, resulting in fine lines and wrinkles. While aging is inevitable, you can delay signs of aging by addressing their causes with specially formulated skin care products. The skin of eye area is thinner than the skin on the rest of your face. There’s less collagen in the area to begin with, so it’s the first place to take a hit when collagen production declines. Plus, the skin around the eyes is pulled and stretched every time you make an expression. Additionally, the eye area has less oil glands is also more prone to dryness, which further contributes to fine lines and wrinkles. Finally, fluids tend to pool under the eyes, causing dark circles and bags. Thus, your eyes have different requirements for hydration and nourishment than the rest of your face. They need a little extra TLC from an eye cream! If you’re not using an eye cream already, the best time to start is now! Even if you’re in your 20’s, our Eye Cream includes antioxidants that will help to prevent damage before it occurs. 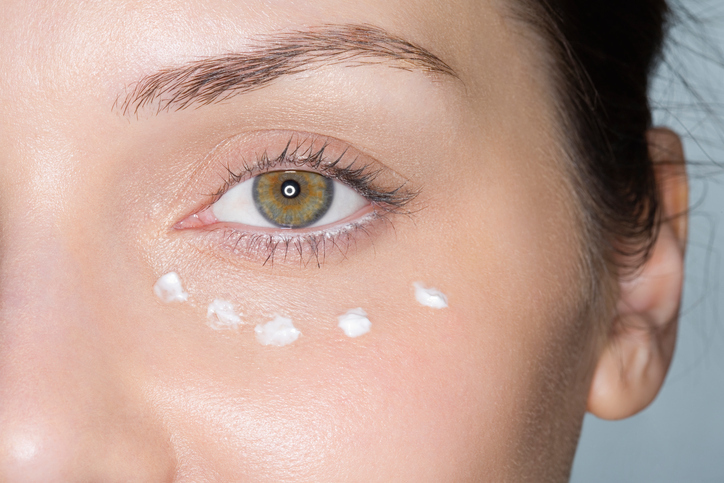 For best results, use eye creams day and night. When applying eye cream, always use your ring finger to gently dab the cream onto the skin. Don’t rub product into skin, as the tugging will just cause more wrinkles. Allow product to absorb completely before applying makeup. Do you use eye cream? Let us know in the comments!